I've got a quick and fun weekend project for you today- and it comes together in about 20 minutes for under 30 bucks! If you follow me on Snapchat @absolutelykylie (you should! You get the inside scoop on our house before anyone else ;) you saw that last weekend Jake and I took a trip to Lowes that got a little crazy. 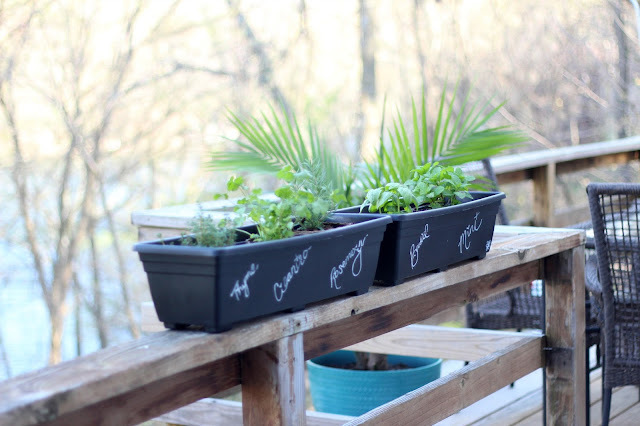 We went for potting soil and ended up leaving with an outdoor sectional, some palm trees, a few planters, and the supplies for this cute little herb garden! You see, in my head i'm Martha Stewart, despite my black thumb. 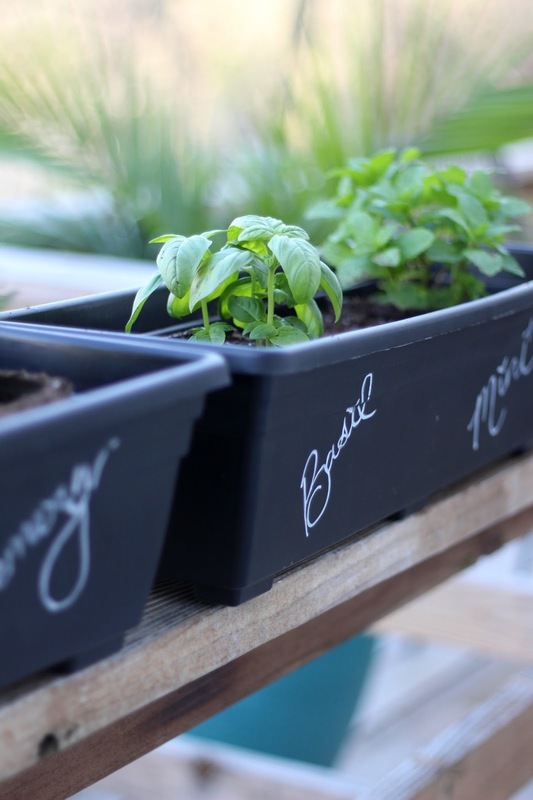 So although I can barely keep grass alive, I had to try my hand at a little herb garden the second I saw the display. I'm only a week in, and although my cilantro is a little droopy, i'm happy to report, all plants are still alive! You need very minimal supplies for this, and very minimal space as well. 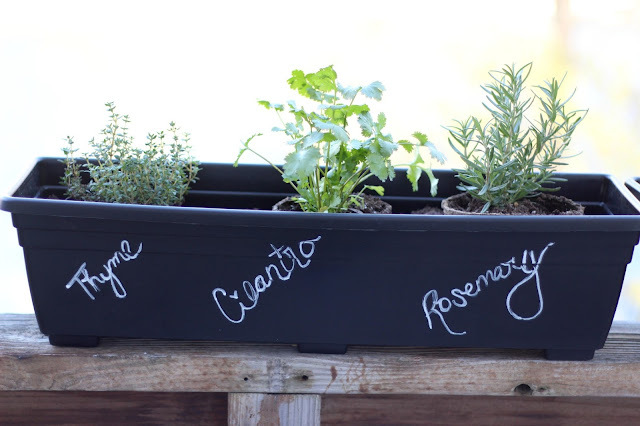 You could easily put this on a small patio in an apartment, or even a sunny window if you don't have outdoor space! I grabbed 2 black planters (7 dollars each), a bag of potting soil, and 5 different herbs: cilantro, thyme, rosemary, basil, and mint. It was hard for me to not go crazy with every single herb I could get my fingers on, but Jake forced me to prove my ability with just the herbs we cook with regularly, you know, in case by this time next week all we have is a bunch of dead greenery attached to our deck. To make things a little extra special, I used a white paint pen to label the herbs, because the black planters reminded me so much of chalkboard! I love how they turned out. 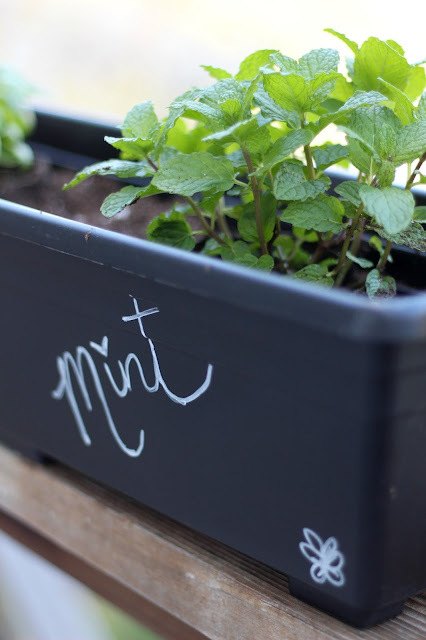 A little added green is sure to perk up your outdoor space! 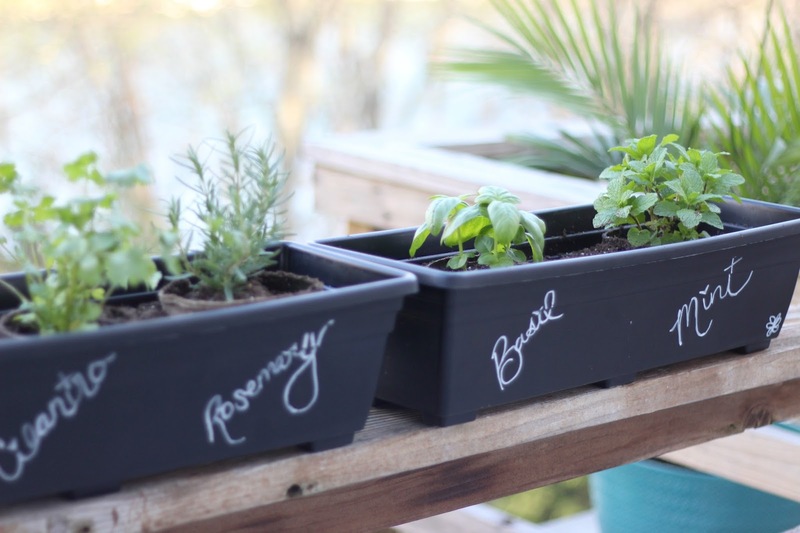 Planting is really simple. 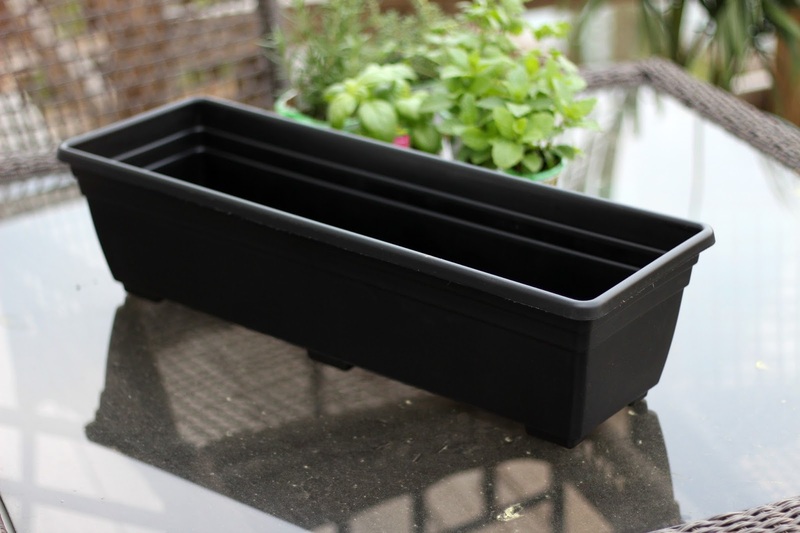 Make sure your planter has drainage, fill it about halfway with potting soil. 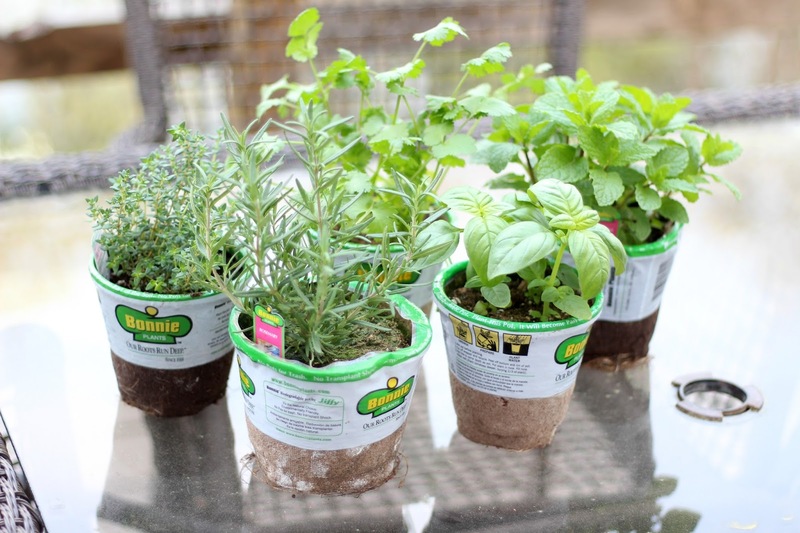 soak your potted herbs, place in planter, cover with dirt, and water. 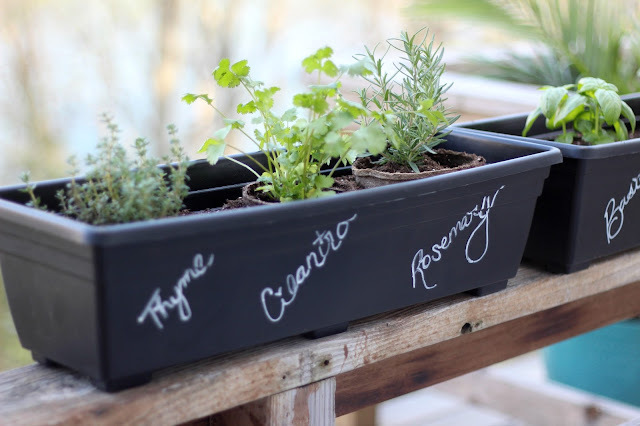 It took more time to label the herbs than it did to plant them! Do you ladies have any tips for keeping plants alive? I think I might try my hand at tomatoes if I prove successful on the herbs! Thanks for coming by as always! Have a wonderful weekend- you'll find us on the deck soaking up the sun! I am totally doing this once we move! Do it, lady! It adds the perfect pop of green to your patio, and who doesn't love fresh herbs?! xo! This is so cute! I saw this on Saturday morning and went out bought the supplies and created my own! Thanks for sharing your awesome DIY ideas. One of my suggestions is to water the same time every day...it becomes a routine so you never forget :) i like to do mine in the morning before i leave for work. Yay! I'm glad you tried it, Rebecca! I've been trying to water in the evening when I get home-first thing! Luckily we've had tons of rain the past few days as well so i've gotten off easy ;) Have a great week!